Published: Oct. 9, 2016 at 03:56 p.m. The game's first turnover come's at the worst time for the Chicago Bears, as Cameron Meredith gives up the football and the Indianapolis Colts recover. Published: Dec. 27, 2015 at 01:43 p.m.
Colts Vontae Davis picks off Dolphins Ryan Tannehill in the endzone. Published: Nov. 22, 2015 at 03:39 p.m.
Indianapolis Colts linebacker D'Qwell Jackson picks off Matt ryan for a 6-yard touchdown. 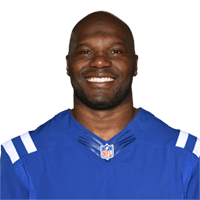 Published: Nov. 22, 2015 at 03:24 p.m.
Colts D'Qwell Jackson recovers Falcons Tevin Coleman fumble.